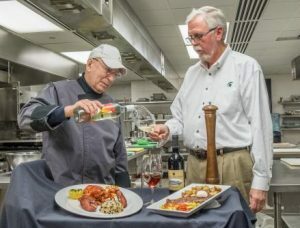 The School of Hospitality Business at the Eli Broad College of Business, the Kellogg Hotel & Conference Center at Michigan State University, the Michigan Wine Collaborative, and the Michigan Department of Agriculture & Rural Development have announced a new partnership. Beginning this year, they will jointly plan and execute the annual Michigan Wine Competition.The 2019 Michigan Wine Competition will be the 42nd annual wine competition, of which the last 18 years were hosted at the Kellogg Center. Unlike the early years, when wines were judged in an area near the aromatic livestock barns during the Michigan State Fair, the competition has evolved into a highly competitive and professional event held in ideal testing conditions at the Kellogg Center. The results are shared with the public at the annual and elaborate Gold Medal Reception, also held at the Kellogg Center. The partners will use this opportunity to expand the scope of what this competition represents – it has always been an important tool for Michigan wineries to gauge the quality of their wines among their peers, and now it will be a vehicle for valuable education for future hospitality professionals. The competition/judging will take place Tuesday, July 30 and the public event at which the winning wines can be tasted is on Thursday, August 8. Both will be held at the Kellogg Hotel & Conference Center.